‘This inhumane event is not part of the mainstream Hindu faith. https://rantingsfromavirtualsoapbox.wordpress.com/2014/07/31/stop-the-gadhimai-festival/ – Please note it would be better to take the latest actions below rather than those included in the above page. This barbaric slaughter is funded by the Nepalese government to the tune of over £32,000, which is the sum paid last time in 2009 for the animals to be sacrificed. The animals were not provided with any water and food in the days before the sacrifice. Many young animals had in fact already died from stress, exhaustion and dehydration before the killings started. Their bodies were left among the live animals. Everyone could kill anything, with whatever knife or sword. Many animals died an unbearable slow and violent death because the butcher was inexperienced and the knives were not sharpened properly. 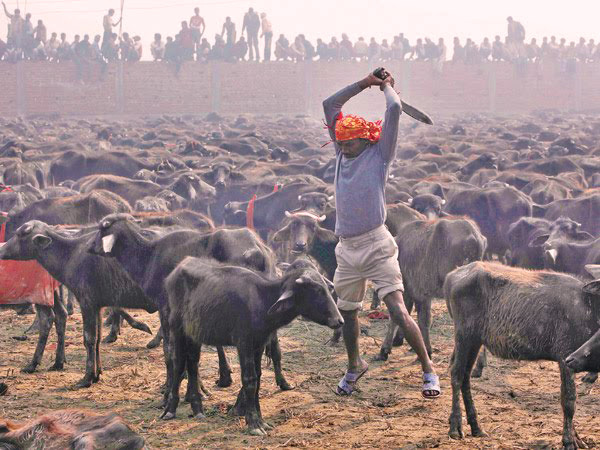 Thousands of buffalo were standing in an enclosure when butchers holding swords started hacking randomly at the animals. Some heads could be severed in one cut; in other cases, it took the butchers a long time to kill the buffalo. No one was holding the animals – many tried to escape. Baby buffaloes were bleating and searching for their mothers. Soon they were walking around in a pool of blood. They were hunted down by the butchers. Needless to say, not a single animal survived the bloodbath. After witnessing the suffering inflicted on these gentle, loyal animals, I feel deeply upset and ashamed of my country. If you are not convinced of the shocking brutality Enter Gadhimai festival in Google’s images or other search engine. I was going to include a selection of photos here but feel it may put off sensitive people from reading further. Frankly if you do not find the images shockingly distressing you are in the minority. There are a number of actions you can take. Please take as many as possible. All Actions may be taken by anyone anywhere in the world. Compassion in World Farming CWF and Animal Welfare Network Nepal have made a huge effort to campaign against this festival in an attempt to get it stopped. Please support them. The Nepalese Government provides significant funding, which makes this festival possible at its terrifying scale. In 2009 the Government paid over £32,000 for animals to be sacrificed. That’s almost 50 times the minimum Nepalese annual wage. We are calling on the Nepalese government to stop this funding. Please join us and sign our petition! sign, then send it back to us by September 30th at the latest. sure more attention is paid to it when it arrives with it’s recipient. Please take action as soon as possible, particularly if writing letters. I wrote last time to government officials. However last time there was not the support to get this stopped as there is this time round. This time if we spread the word as widely as possible we may be able to stop this cruel festival that has no place in the modern world or as a part of Hinduism. It is an anachronism of a bygone age used by unscrupulous people to make money. These people prey on the superstitious dread of gullible people. Maneka Gandhi, an Indian politician and activist, is outspoken in her disapproval of the tradition. She has explained that many villagers refuse to end the slaughter for fear that they will dishonor the goddess of power, called Gadhimai. In addition, Gandhi explained that the festival is an incredibly profitable enterprise for priests, moneylenders, and animal sellers, who have incentive only to continue the inhumane practice out of greed. To the disgrace of the Nepalese government, the brutal killing of over half a million animals at the Gadhimai Festival in 2009 was sponsored by the country’s Government. Nepal is the birthplace of Buddha, a religion revered throughout the world as a religion of peace and non violence. Nepal is predominately Hindu, according to the 2011 census, 81.3% of the Nepalese population was Hindu, 9.0% was Buddhist, 4.4% was Muslim, 3.0% was Kirant/Yumaist, 1.42% was Christian, and 0.9% follow other religions or no religion. There is no place in Hinduism or Buddhism that allows for or condones or demands such barbarity.Compassion in World Farming say the mass killing is opposed by the global Hindu community and that there is no religious justification for it. The Nepalese Hindu Forum UK completely opposes animal sacrifice as Hinduism does not sanction the killing of living beings… There should not be any place for this inhumane, barbaric sacrifice of innocent animals in the name of any religion. Furthermore Nepal is a secular state predominately socialist/communist. There is no place in communism for superstitious belief. The fact that the Nepalese government support such barbarous festivals based on primitive superstition is incongruous to say the least. “I love Nepal – both the land and its people. Can you imagine taking the kids for a trip to the zoo or wildlife park and afterwards eating some of the animals in the restaurant? Just when you think you have heard it all concerning the appallingly shocking and callous treatment of the other animals with whom we share this world you hear of yet more sickening and outrageous atrocities, which in this case are bizarre to the point of being unbelievable. As incredible as this may seem if you visit the Langenberg Wildlife Park zoo in Switzerland you are likely to find their “surplus animals” on the Menu! You can find boar sausages, venison in cognac and wild deer carpaccio listed on the menu in their restaurant. Since 2012, 49 deer and 10 wild boar have been shot, killed and served in the restaurant. That’s right you read it correctly: To deal with its “surplus” of animals, the Langenberg Wildlife Park zoo in Switzerland has been killing their animals and serving the meat in it’s own restaurant. Langenberg Wildlife Park, a zoo in Langnau am Albis in Switzerland, has been selling meat from its own animals — from deer and boar — in its restaurant. Every year, about 100 animals are born at the zoo. Due to what are said to be “space restrictions,” the zoo says it cannot keep all of them. If the zoo is unable to place the animals elsewhere, they are killed and served to diners in the zoo’s own restaurant. 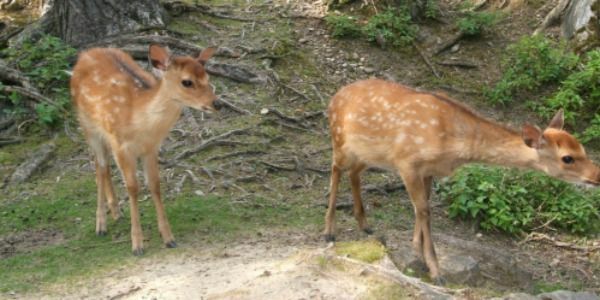 Tell Langenberg Wildlife Park, stop serving “surplus” animals in its restaurant. The zoo must stop killing healthy animals and, if it has no use for them, find other places (a wildlife refuge, for instance) for them to live. Here are some of their even more bizarre justifications. Wow how cold-blooded can you get. This is just so disturbing, so inhumane, so callous. Doesn’t this person consider just how shocking that statement is! To use the word recycling when referring to a living being is as callous as it gets, it shows no respect for the lives of the animals or the fact that they are sentient creatures. For a wildlife park that is dedicated to the preservation of animals to kill the animals in its care is shocking. So shooting healthy animals is not harming them! Surely he cannot imply that killing healthy animals comes under the category of animal welfare. Again yet another instance of helpless animals at the mercy of soulless individuals who have no respect for the right of these animals to live out their lives. ‘It’s bizarre, the whole purpose of a wildlife park is to protect animals, not make them a food item. We need to demand a better more ethical solution such as relocation to other wildlife parks or sanctuaries. Langenberg and similar places should consider the lifelong care of its animals and their off spring. Please sign the petition, maybe if enough people do so we can convince these thoughtless people to have respect for their animals and to value their lives. Time to leave animals in their natural habitat where they belong. Conservation has only been necessary as a result of the activities of man who have endangered animals and until we do something to curb such activities no animal is safe from extinction. Zoos, wildlife parks, safari parks and other pretences at conservation give little consideration to the individual lives of animals. Recall the killing of Marius the baby giraffe at a zoo in Copenhagen yet another “surplus” animal killed despite numerous offers world-wide to rehome him. Also lions at Longleat Saffari park again killed because they were surplus or did fit in with the scheme of things at the park. And only recently the animals at Ohio zoo who were about to be euthanized again there were may offers to relocate. It sickens me that humans have the power over the life and death of over beings, sentient creatures who wish to live, who have the right to their lives as much as we do.What right have we to interfere, to use and exploit animals.We like all of natures creations are just one species among many, we have no special remit or stewardship, no rights, no domain. Tory Mindset: More reasons not to vote conservative in the next election. In just eight months time here in the UK we have an important choice to make at the next general election. Don’t be led astray by Tory lies as many people where last time, such as promises not to privatise the NHS. The reality is, The Tory party are the party of the rich for the rich, it has always been so and continues to be so. There is a certain Tory mindset which belongs to a time of great social injustice and unfairness that we had thought was consigned to history. Here is a recent example of this mindset concerning the disabled. That this man continues to have such an influence over the lives of the sick and disabled – and for that matter the unemployed plus the many underpaid workers on benefits – is an outrage. Some have tried to defend him but his alleged intentions don’t compensate for the rampant bigotry, the second-class citizen perception of the disabled which he perpetuates. The above poster refers to a recording, made during a fringe meeting at the Conservative conference where Freud said that some disabled people could be paid just £2 an hour if they wanted to work. These comments are discriminatory and offensive yet Freud has gotten away with a weak apology and gets to keep his job. According to the Centre for Welfare Reform, recent Government cuts absolutely hit the disabled hardest, with the burden of cuts on the disable 9x as painful as those affecting the general public, and the cuts on those with the most severe disabilities 19x worse than those on the rest of the population. 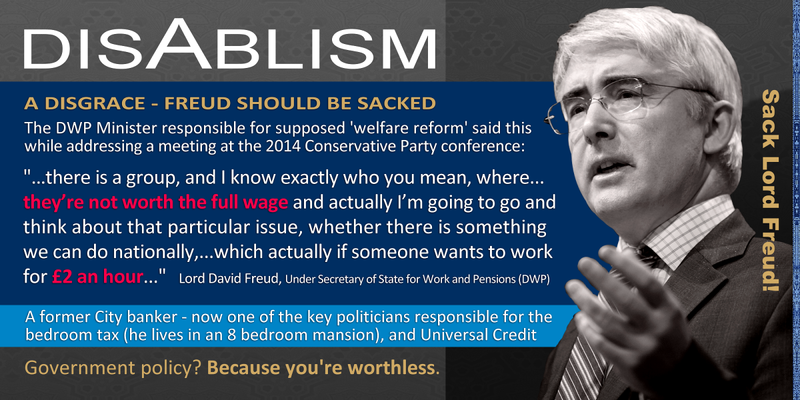 Lord Freud, the Minister for Welfare Reform has suggested that disabled people in the UK could be paid £2.00 per hour! The Current minimum wage is £6.50 (£8.80 in London). These comments are offensive and demeaning to all disabled people and he should be sacked immediately. This Government seems keen to abolish slave labour in the UK, but £2.00 per hour is just that – Slave Labour! Why not write a e-mail or letter to tell him what you think. Please be polite you can express yourself in the strongest terms without being abusive. Abusive correspondence doesn’t get read and is unlikely to receive a response. It is more than likely that Freud is voicing the Tory party’s opinions but has made the mistake of voicing them in public. Freud has made previous unacceptable comments including saying that families affected by the”bedroom tax” can “go out to work” or use a sofa bed when the children come to stay. What right has this millionaire with his eight bedroom house to say that disabled people are not worth the minimum wage, which in any case is grossly inadequate. Lets see him live for a year on a £2 per hour wage – no not in his mansion but in the real world were most of us live from day to day struggling to make ends meet with extortionate rent or mortgages, rising prices, low wages, unemployment and increasing poverty. Who can live on £2 per week, it’s simply not possible. It appears that the Tories are determined to make wages as low as possible and are desperately looking for places where this may be implemented. Right now so called apprentices get only £2.95 ! I used the term apprentice lightly as do the Tories who consider such jobs as retail placements in shops such as Shoe Zone as an apprenticeship rather than the more usual trade apprenticeships such as a mechanic, a plumber or a hairdresser. Even if this applied to genuine apprenticeships this wage is inadequate and is nothing other than exploitation, but to use the excuse of apprenticeships to make paying people a low wage for learning a trade is unacceptable. This low wage is applied to anyone between 16 and 18 and anyone over that age for one year. Cameron intends to reduce the benefit cap further in order to finance these sham apprenticeships. November 2012: Appeared to compare welfare claimants to corpses. Argued that the benefits system allowed claimants to “have a lifestyle” on the state. In the same month, he told a magazine reporter that the welfare system discouraged people from “taking risks” to make money. “People who are poorer should be prepared to take the biggest risks; they’ve got least to lose,” he said. July 2013: Insisted the increase in numbers of families using food banks was not necessarily linked to benefits sanctions or delays. Suggested more people were going to food banks because more of them existed – and even denied they were even part of the welfare system. May 2013: Said children of families affected by the so-called “bedroom tax” could use a sofa bed when visiting a separated parent. Added that families with young children in social housing who have more than their allocated number of bedrooms could “earn more money”. March 2014: Claimed it was “hard to know” why people turned to food banks. “Clearly nobody goes to a food bank willingly. However, it is very hard to know why people go to them,” he said in response to a question on welfare cuts “driving families” to the facilities. Freud’s remarks, particularly his latest, are not really much of a surprise are they considering the Tory party’s discriminate attitude to sick and disabled people with their unfair welfare reforms. This government’s assault on the most the vulnerable and poor in our society is just so typical of the Tory right wing mindset. Freud’s comments well demonstrate the mindset of the Tory government concerning people with disabilities. Never forget the many deaths that have resulted from unfair benefit assessments by ATOS as instructed by the DWP which have found seriously ill people fit for work. Also benefit sanctions that have seen claimant’s benefits cut or stopped altogether. Welfare reforms are not an issue of incompetence but a deliberate attempt to leave sick and disabled people and the unemployed without an adequate income or in many cases no income at all. It is an attempt to slowly whittle away at our welfare system to eventually eradicate it altogether. The government deny any culperbility in the deaths by suicide and even starvation of benefit claimants, yet there is no doubt that in one way or another welfare reforms have been responsible for the deaths of many vulnerable people along with the suffering and misery of insecurity, poverty and in some cases homelessness and destitution with charity from a local food banks as the only means for people to feed themselves and their children. Freud played a leading role in the vicious welfare reforms that have destroyed lives and continue to destroy the lives of society’s most vulnerable. The government’s reforms, which have come to the attention of the UN, have no place in any progressive society. Here is comprehensive information concerning the affects of benefit reforms now and in the future. How are welfare benefits changing for disabled people? No group will be more affected than disabled people under welfare reform changes. This is due to the culmination of multiple cuts to disability and carer’s benefits, the abolition of entitlement to some benefits and tax credits under universal credit (2013-2017) and increased restrictions to benefits linked to wider welfare reform changes. Research by Demos/Scope show that by 2017-18 around 3.7 million disabled people will collectively lose £28 bn in benefits. 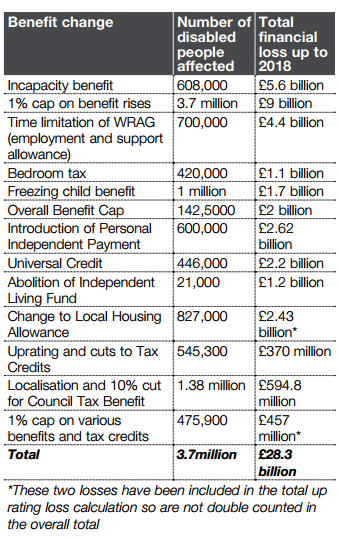 The table below shows how many disabled people will be affected by each benefit change. This news does not come in isolation. We are in the climate of the Work Programme and employment and support allowance travesties, in jobseeker’s allowance sanctions and personal independent payment delays. Coerced, free labour and a shrinking, ever conditional benefit system. Freud has not spoken out of turn, but encapsulated Conservative attitudes to both disabled people and workers: pay them as little as possible and they will be grateful for it. This is the man that helped devise the despised Atos benefit assessments that have driven disabled people to suicide and ill health in the name of strippping their benefits or forcing them into endless ‘work related activity’. The same Minister whose department introduced the Work Programme, on which sick and disabled people can be sent on workfare, potentially for months on end. http://johnnyvoid.wordpress.com/2014/10/19/freud-must-go-urgent-call-out-monday-october-20th-caxton-house-12-30pm/– I love this blog, Johnny Void speaks with unreserved passion against this government and speaks out for people who are vulnerable in society. The reduction in the welfare cap will have an impact on an estimated 70,000 households, with 40,000 hit for the first time according to figures released by the Conservative party to the Press Association. Up to 30,000 young people will be hit by the removal of housing benefit from those aged from 18 to 21 who will see their jobseeker’s allowance replaced by an allowance limited to six months. Claimants who fail to find a job or an apprenticeship after six months will be forced to perform community work. Urgent Action Deadline 22nd October : Please Help Save Exotic Animals From Being Euthanized! Please help with the following petition and take action today to help save the lives of animals at a sanctuary in Ohio. This week, the Tiger Ridge Exotics animal sanctuary in Ohio wants to needlessly euthanize its animals, which includes endangered tigers, black leopards, lions and bears. Once an exotic animal breeding facility, the sanctuary failed to update its facility to ensure a safe environment for the animals. Now, the state is giving the owner until October 22 to turn over his animals to a safer sanctuary. However, he is threatening to euthanize the animals instead! Please sign a petition to urge Ohio’s state officials to stop the owner from senselessly euthanizing the sanctuary’s animals! Please click the following link for more information and to sign the petition by October 22nd, so please do not delay. This is a simple petition which requires only a signature and an optional comment. There is not much time, but still time to share, so please share widely on facebook Twitter and other social media. This is just so appalling, these animals are literally at the mercy of this person, all the animals are healthy and have been offered places at more suitable sanctuaries where they will have a better life. It is sickening that people such as Hetrick have the power over other living beings and are able to decide that they should die as though their lives are worthless. Animals have a right to their lives as do we, animals value their lives as much as we do and wish to live. Survival is a basic instinct common to all creatures. Please take action to save these animals and sign the above petition. Anyone from anywhere in the world may sign. Tax Payers Money Used to Fund Bull Fighting! Did you know that your taxes help fund the cruelty of bullfighting ? Most people are unaware that their hard earned money is going to fund this abhorrent barbarity. All British taxpayers subsidise this cruelty. Yet the majority of British people are opposed to bullfighting, according to a 2008 poll conducted by the League Against Cruel Sports 89 per cent would not visit a bullfight. Here is the reality of bull fighting: – A very distressing video, make me ashamed to be human. It is time that this barbarity was banned by the EU. At least lets impede this brutality by urging your MEP to vote to stop European subsidies for bullfighting this coming Wednesday 22nd. This morning I received the following notification in my e-mail from the League Against Cruel Sports. Please read and take the suggested action. There is a deadline of Wednesday 22nd October which doesn’t give us much time. There is a suggested template letter which I will included further down. Farmers breeding bulls to be tortured slowly for public display can never comply with these conditions and therefore should not be eligible for agricultural subsidies. Bullfighting relies heavily on the backing of European funds and also funds from Spanish Administrations. Without these payments, trends show that this bloodthirsty industry would be on the brink of collapse. We need to demonstrate political and public support against the use of our taxes being used in this way. Please contact your MEP and urge that they vote to stop European subsidies for bullfighting on Wednesday and please do let us know how they respond by emailing us at campaigns@league.org.uk. You can choose to contact any or all of your MEPs that are listed as there will be several representing your region. You can find out who your MEPs are by going to www.writetothem.com and entering your postcode. We have provided some suggested text for you to use if you wish, but please use your own words as much as possible. The links to www.writetothem.com are perhaps not the best way to contact your EMP if you are not able to personalise your e-mail with your own words as according to the website’s information, cut and paste e-mail is deleted: “Use your own words; we block copied-and-pasted identical messages”. http://www.europarl.org.uk/en/your_meps.html#shadowbox/1/b – EMPs for your region, you will have more than one. As one of your constituents I am asking if you would please vote for an amendment which opposes the use of our taxes being used to help fuel the bullfighting industry. As you know, next Wednesday the European Parliament will be voting on budgets for 2015. Each year the European Union provides an estimated £110 million through Common Agriculture Policy (CAP) payments to farmers who breed bulls for bullfights. £13.5 million comes from the UK alone. Next Wednesday you will have an opportunity to support an amendment to prohibit the use of European funds to support farmers who breed bulls for bullfights. The specific amendment on bullfighting is amendment 12 of the Green/FHA group, submitted by Indrek Tarand MEP. Animals should not suffer pain, injury, fear or distress. The CAP allocations toward the bullfighting industry are a clear violation of this Convention. Bullfighting relies heavily on the backing of European funds and also funds from Spanish Administrations. Without these payments, trends show that this barbaric industry would be on the brink of collapse. I sincerely hope you will be able to take a few moments to support this important initiative. Say No To Fracking Under Our Homes. Help protect your home, your health and our countryside, say NO to fracking. The government are engaged in more covert underhanded schemes, this time they intend to change the law with regard to fracking under our homes without our permission despite the fact that the majority of us would not want this to happen and, given the choice, would deny permission. Again out of the window goes democracy. The government have ignored over 40,000 formal objections. Never mind what you or I want the government intend to do just as they please and frack under your property. It gets worse: As part of the Infrastructure Bill the UK government intend to allow fracking companies to put “any substance” under our homes and property and leave it there. The government propose to do exactly as the please and despite 99% of responses to a public consultation saying no, the government intend to frack under our homes. Fracking threatens our air and water, our health, our countryside and towns. Fracking will industrialise the UK, including our national parks, such as the Yorkshire Dales , the North York Moors and the South Downs. Fracking has also led to, air pollution, health problems from headaches to cancer, multiple earthquakes, water shortages and rocketing greenhouse gas emissions. Needless to say we don’t want it here, the only people to benefit are company’s such as Cuadrilla. All across the USA people are rising up against fracking. They don’t believe the process is safe and think it causes wide-scale land contamination. Ever more extraction sites are being approved and developed with new plant being built in once idyllic landscapes. If we don’t act this could happen here. Already licences have been issued to frack on 60% of land here in the UK! As more and more action camps spring up everywhere the government is getting worried and this is the reason they want to change the trespass law so they can frack under your land without permission. We already knew that fracking was a bad idea, but this is astonishing. Last night, David Cameron’s plan to allow fracking firms to drill under our homes was rubber-stamped by the House of Lords. But here’s where it gets even worse: At the very last moment, the draft of the law was updated to allow fracking firms to pump “any substance” under people’s homes and property — and leave it there! This makes a mockery of the prime minister’s claim that UK fracking regulations are some of the most stringent in the world. And it absolves fracking firms of any responsibility for clearing up the mess they create. Our MPs are now the last defence before the laws are approved by Parliament. Sign the petition to the Department of Energy and Climate Change. The government just declared war on the British people over fracking. It’s going to allow companies to frack under our homes without our permission — despite 99% of responses to a public consultation saying an emphatic NO. A massive 40,000 people formally objected to proposals to change trespass laws so that fracking companies can extract oil and gas from under people’s land without permission.Showing utter disdain for democracy, the government has decided to ignore this outpouring of public opposition, and go ahead with changing the law in favour of the frack-happy 1%. Please share both petitions with your friends and family, on facebook, Twitter, blogs and other social media. Letters and e-mail from constituents are often very effective, particularly letters, though my MP responds to both. And while we are about it we must stop fracking in the National Parks and other rural areas. The fracking industry has already been mired in accidents and mistakes. In April 2009, cattle were discovered dead near a drill site in Louisiana. An investigation later found fracking fluid had leaked from the well pad and run into an adjacent pasture. And in July 2013, US fracking firm XTO Energy was forced to shell out $100,000 in compensation after a spill of contaminated wastewater in Pennsylvania. Despite claiming that the UK has tough regulations to prevent disasters like this, the government is now rushing to remove obstacles, muddling through laws that will put the interests of shale drillers before the safety of our environment and our climate. We don’t have long before MPs will get their final say on Cameron’s plan to allow drilling under our homes. If we can show them how unpopular his idea is, they’ll think twice before voting it through.